Submitted by Norm Roulet on Mon, 08/04/2008 - 09:23. 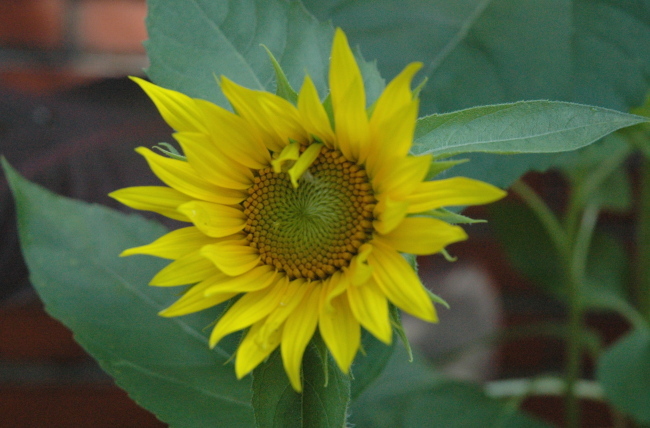 I've always loved sunflowers, but the bright, sunny blooms glowing in our front yard this Summer are special. The seeds were from the work of art below, in the "To Masumi" memorial exhibition, held last October, in celebration of the everlasting, peaceful, sunny spirit of Masumi Hayashi, the great photographer killed a year earlier, in Cleveland, with other great Cleveland artist John Jackson. The Masumi Sunflower seeds distributed in Tremont may have been planted anywhere on Earth, and I wonder where else such Masumi Sunflowers are growing today, from this one showing of love for love and art received and lost. I imagine ours are the only Masumi Sunflowers in East Cleveland, this year, but I may be wrong... do you have any in your yard or neighborhood, that you know? It occurs to me we have a responsibility to harvest and further distribute the seeds now growing in our Masumi Sunflowers, if possible... these first generation Masumis could spread across the globe, and quickly reach billions. There could be no stronger symbol of peace to spread around the globe than Masumi Sunflowers... how far has her energy reached in this first year of bloom? How far may we spread her energy now? 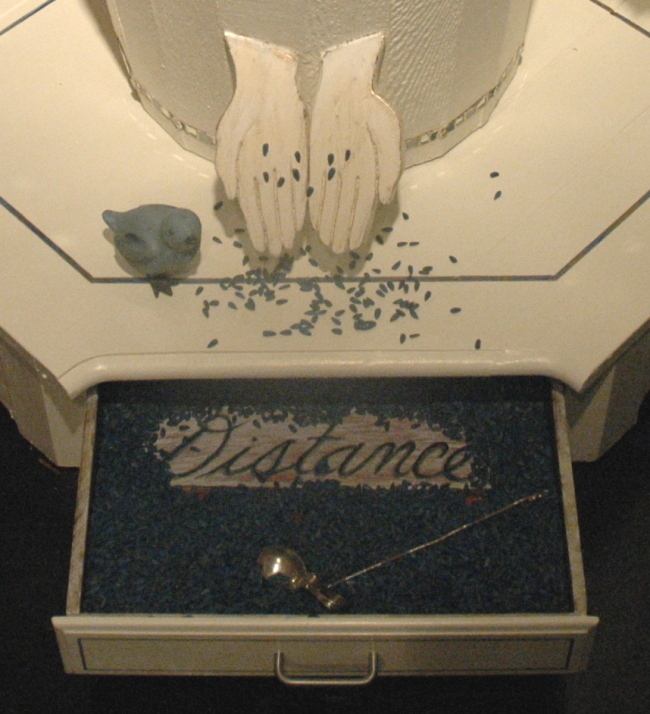 The Jacksonesque sculpture where we received our seeds featured the word "Distance" and is shown below... I'm sorry I don't know who was the artist, and I don't have a complete photo... anyone have more details and images of this? Submitted by lmcshane on Mon, 08/04/2008 - 20:10. This is the anniversary of two year my involvement at RealNEO, which began with the murder of my friend John Jackson, and was commemorated with the murder of three people last year during the heat of the summer and is now commemorated with the murder of a mother at the hands of her son by a quiet, introspective boy who loved birds. Is this a message? Submitted by Norm Roulet on Wed, 08/06/2008 - 14:33. Time has flown since you joined REALNEO, 3 years and 25 months ago. Submitted by Evelyn Kiefer on Tue, 08/05/2008 - 22:57. For me the sunflower in the photo is really a reminder of chance and hope in the world. My three year old son helped me plant the seeds in May and accidently dropped one there by the sandstones of our front walk. I can't believe it survived in such a high traffic area with kids, dogs, guests and our mail carrier walking through each day. There are many others now blooming in the beds, but this one seems so bold. A neighbor boy who is seven asked me if we are trying to make our house fun with all the color in the front yard (by color he meant our flowers). I said yes, but I had not thought about our flowers in that way until his question. Submitted by noner on Wed, 10/07/2009 - 08:37. This piece was created by Joan of Art (Joan Deveny) for the show I curated to masumi: 27 artists at doubting thomas gallery two (?) years ago this month. What a nice surprise to find the photo collage of our show this morning! I was looking for the header image to comment on and found this. Submitted by Charles Frost on Fri, 09/05/2008 - 21:16. Share pictures of your guerrilla sunflowers in the boards of the Community. Sunflowers below Albert Barnes House, SE1. Naomi Klein: Has the president turned his back on black America?